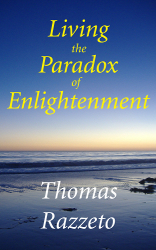 Learn about enlightenment and spiritual awakening in simple, clear English with Thomas Razzeto. The philosophy presented in my work goes back thousands of years and is sometimes refered to as “nondual wisdom.” Through this website and my book, I hope to offer you a fresh and easy-to-understand expression of this wisdom in simple, clear English. It hardly needs to be mentioned that I am just offering my own opinion for your consideration. You can take what you like and leave the rest. Even though some of us may see things differently, I hope that my work will inspire us to respect one another, treat each other kindly and work towards personal and world peace. With that in mind, here are some of my completely free essays, poems, songs and book excerpts. Just click the title of any essay that interests you. This might be a good one to start with: How My Teachings Are Unique. This is perhaps my single most important essay. I write passionately about this profound ancient wisdom because I want to help ignite the process where these concepts are transformed from mere ideas into a living truth that burns within your soul. • You exist fundamentally as pure awareness, as the open capacity for experience. • The awareness that is looking out of your eyes is the same awareness that is looking out of my eyes. There is only One Awareness. So your fundamental identity is Source-Awareness, the one, uncreated, formless Divine Essence. Your nonfundamental identity is the totality of created reality. This is what you are through the process of creation. And your functional identity is the person you appear to be. All of this is thoroughly divine. God is infinitely intimate with all of creation. It is God who is arising as everyOne and it is God who is doing everything. How wondrous! Reading this 3-page essay is the fastest and easiest way for you to find out if my work will resonate with you. I hope you will enjoy it. Way back in 1980 I started to read some of the Seth books, which were channeled by Jane Roberts. I found Seth to be wise, insightful, compassionate and humorous. I quickly felt comfortable with his refreshing ideas and applied the material to my life, as best I could. Seth often joyously proclaimed, “You create your own reality!” In my opinion, this means that you create both your own emotional state of being and the circumstances that arise around you. Let’s take a look. 1) Your core beliefs are the key factor in the creation of your emotional state of being. 2) Your circumstances are a reflection of your core beliefs, emotions and actions. Since your core beliefs are at the beginning of this creative process, this is where all effective change takes place. And since your circumstances are just a reflection, you simply focus on your state of being. If you desire a change in your state of being, you change your core beliefs and then take wholesome (unselfish) action that corresponds to your new belief. Once you understand these two points, you will no longer focus on trying to fix your outer circumstances by directly manipulating them. And here is one more very important point: You cannot just create anything you want. The specific outer circumstances of the future are always unknown. This is true even though all outer circumstances are just a reflection of your core beliefs, emotions and actions. For example, if you believe that you are not good enough to be loved, you will feel unloved and your examination of your circumstances will seem to verify this belief. Yet even if you do believe that you are good enough to be loved, you still will not be able to dictate that certain people will love you in the way that you want. But you will now be open to the love that God will bring you through the kindness of some of the people around you, perhaps in ways that you did not even expect. So you will now have the experience of living in a loving world. What a profound shift! So the universe is not your personal mail order catalog simply waiting for you to clearly make up your mind and place your order as some people have claimed. This is not about creating specific outer circumstances so that you can then become happy. If you are not happy most of the time, then you must first change the core beliefs that are preventing you from being happy. Your most natural state of being is the one filled with joy and peace. Think about that for a while. And notice that it takes no effort to simply be in your natural state. When you let go of fear, this is what you relax into. And in a very beautiful way, this is the optimum state for God’s love to flow through. It is easier for a happy person to be a loving person. At its deepest level, this is about releasing limiting beliefs such as “I am not good enough to be loved” or “I don’t fit into this world” and embracing the core beliefs that you are good enough to be loved and that you do fit into this world beautifully. This allows you to be open to the changes that God’s love, wisdom and power will bring you. As your trust in God grows, you will discover that peace and joy are always available to you, no matter what your circumstances are. This recognition gives you the freedom to comfortably put your values of caring and sharing into action with a spontaneous aliveness that you have not known before. How beautiful is that? Read more in this 5-page essay, which is an edited excerpt from my book. Your natural emotional state of being is one of peace and joy. When you let go of fear, this is what you relax into. I hope this essay will help you relax into peace and joy more easily and more often. You don’t need to be concerned about why it might be possible to let go of fear and worry at any time, you only need to sincerely give it a try. What I offer here is pretty simple and the trick is to just give it a try. You can read more here. • Why Do We Call It Nondual Wisdom? The term “nondual” means “not two” and it comes about because God and creation are seen as One Reality, not two. This wisdom holds that the unseen Creator arises as the creation we see all around us. This is like an actor arising as a character. There is a difference between the the actor and the character since the actor still exists even when the role of the character is dropped. The actor is the source of the character; it’s not the other way around. Yet when the actor arises as the character, they are one. You can read more here. I like to talk about the serious shortcomings of the book, The Secret, and why I think that the Seth books, as channeled by Jane Roberts, and the work offered by Bashar, as channeled by Darryl Anka, offer a much more helpful approach to creating a fulfilling life. With The Secret, you are supposed to focus your thoughts on the specific outer conditions that you desire. But I think you should instead focus primarily on cultivating a positive inner emotional state of being first, before you even consider your outer circumstances. This is done by working on your core beliefs, which are just habitual thoughts that you have come to accept as true. Your core beliefs are not fleeting or superficial conscious thoughts, but instead, they are ingrained habitual thoughts. But even so, they can be easily examined and changed if you choose to do so. These new beliefs will lead to a new emotional state of being, and when you then take new action based on your new belief, you will soon see new circumstances arise around you. This essay is a good complement to the Seth essay above. • Is the World an Illusion? Why would anyone say that the world is an illusion? What is a good definition of an illusion? How can we find out more about the big picture? In late 2005, I became aware of a man on California's death row named Stanley “Tookie” Williams. He was scheduled to be put to death in just a few weeks and there was an effort to prevent this. This is the story of my experience with the deep sorrow that arose within me when I learned that this reformed man had indeed been put to death. This experience was so profound that it changed my life in a very deep way. Perhaps you will be inspired by what I have to share about this. While this is not strictly an excerpt from my book, it is still an excellent summary of many of its key points. If you like this essay, you will probably also like my book. The translation of the word “anatta” as “no self” has caused, in my opinion, a fair amount of confusion and this has been going on for a very long time, perhaps over two thousand years! For example, you sometimes hear people say that “you do not exist” or that “the person does not exist.” But if you consider “anatta” in its original context of the process of disidentification from the five components of the person – the five "skandhas" – and translate it as “not self,” you have a much clearer idea of the wisdom being offered. And most importantly, the process of reidentificaion as everyOne should not be overlooked since this is what opens up the loving heart of enlightenment. • In Nondual Wisdom, What Is Real and What Is Unreal? Many people incorrectly think that illusions are “unreal.” In other words, they think that illusions don’t exist at all. But an illusion is something that exists in a deceptive way. This misunderstanding is the reason why there is so much confusion about this subject. So in this essay, I will cover what is unreal, what is an illusion and what is real. I will also talk about why some people say that the world is relatively real and why they say that God (Source-Awareness) is Absolutely Real. So let’s jump in and see what we find. How could this be true and yet not be obvious? It's like liquid water and solid ice. They are the same essence in different forms. We are all made out of the same essence but we are not all the same. We are each a unique expression of the eternal divine essence! Through this mysterious essence, we are all connected to each other! We are all divine drops in the ocean of God! Know yourself and you shall know God! You are not simply connected to God, every aspect of your being is divine! God is not just deep within you at a special place; you are divine at every level! Will you love it all, simply because you can? • Mystical Optimism: How to Glow with the Flow! To what degree do we control our own life? Surfing the cosmic wave. Learn to be flawlessly aerodynamic! You are safe in the hands of God! • Beyond Gender: Divine Love! A popular book has a title that states that men come from a far away planet and that women come from a completely different far away planet. The implication is that we have very different fundamental natures, that we are basically different creatures, and can only hope of getting along when we both understand these natures. While this book has genuinely helped millions of people, I would like to add a few comments of my own. Irving Berlin wrote "God Bless America" in 1938 as World War Two was starting in Europe. I have always considered it a very beautiful song. I hope that my expansion of the song to include another verse that includes all of humanity is not seen in any way as me being critical of the original song or of America itself. Here are both verses and also Irving Berlin's prelude to the song. Did John Lennon and Carl Perkins connect with their friends and family from the other side? John Edward is a famous psychic medium who communicates with the spirits of people who have passed on. His 2001 book titled Crossing Over contains many stories that offer compelling evidence for the survival of human consciousness after the death of the body. This essay covers some of my favorites from that book. Read about Carl Perkins, his daughter Debbie, Elvis Presley, Paul McCartney and John Lennon. In addition to John Edward's book Crossing Over I also recommended The Afterlife Experiments by Gary Schwartz, Ph.D. since it goes into this subject in a scientific way. • Houdini's Afterlife Experiment - Did It Work? There are conflicting claims about whether Harry Houdini, the world famous escape artist and magician, after his death in October 1926, was successful in passing a prearranged secret coded message to his wife in January 1929 through Arthur Ford, a psychic medium. Read about the cleverly coded message that was received by Beatrice Houdini (known as Bess) and the document that she signed stating that the message was correct! • Mystical Magic Eye - See the 3-D Dinosaur! Can you see the 3-D dinosaur in the picture to the left? (Don't worry if you can't; it's much easier with the larger image in the essay.) Anyway, why do I bring this up? Well, this reminds me of seeing the mystic's view. Before you understand it, the mystical understanding of the world seems like a jumbled mess of words but once you get it, the clarity snaps into focus. My mentor, Timothy Conway, was kind enough to write the foreword to my book. He even snuck in a few interesting teachings, which is of course, just like Timothy. You can check it out if you are inspired. Thanks for reading some of my work! the 5-MeO-DMT from the Bufo toad. Photo: Garth Norman, Brigham Young University. Click the picture to see it with labels. I have many free essays about 2012 and the Mayan Long Count Calendar. Since I think that the message from the Maya was a timeless message about enlightenment, you might be interested in reading some of my work. In these essays, I discuss the astronomy of 2012 and show how that astronomy was used by the Maya as a metaphor for spiritual awakening. This is more like art than astronomy! In the essay linked above, I show why I believe this understanding came to them through the use of the psychedelic chemicals they found in the Bufo toad. 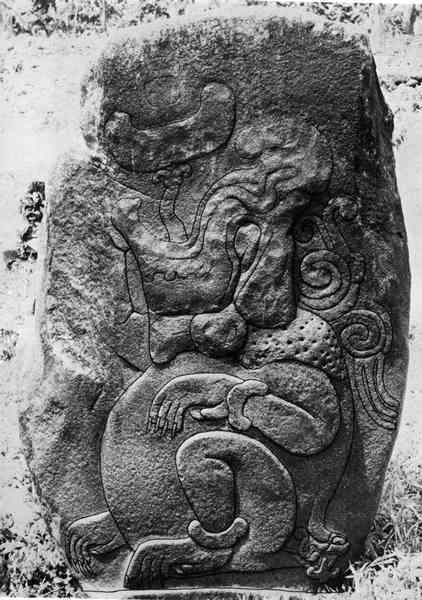 Not only were these toads found in countless stone carvings, the shamans also had stone altars shaped like these toads in Izapa, Mexico, the birthplace of the Long Count calendar. I will occasionally add more essays. I hope you will join us for those! In truth, I honor your divine nature. All website content: Copyright 2001 - 2018 Thomas Razzeto - All rights reserved. The free website template was provided by myresponsee.com.